I often watch movies with my parents on Sunday night. My parents wanted to watch Waiting for Superman (which looks very good), but it was loading like a snail, so we turned to the tube. I had to choose between The Great Escape and Where The Wild Things Are. I liked Where The Wild Things Are, but I didn't really feel like a repeat, so I chose The Great Escape. I love old movies. I used to watch channel 41 (our classics channel) all the time. John Wayne was a favorite, as well as Bonanza and random war movies. 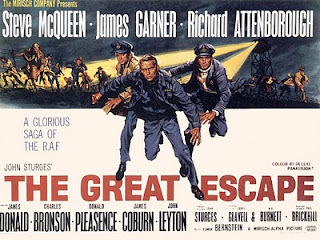 I did watch The Great Escape but it had been a long time. I didn't really remember the end, and I kind of mixed it up with another prison camp movie where they had to ferret out a German spy. Anyway, The Great Escape was very good. I kind of wondered about the original Great Escape. I know there have been several books written on the subject, but I've never read any. The Great Escape is now on my to-read book list! Since I haven't read the book, I, of course, turned to Wiki to glean pearls of wisdom. The movie is fairly accurate in its rendition, but there were some changes. One of the biggest one was that no Americans actually used the tunnel to escape. Well, there might have been one, but they're not sure. In the beginning the camp was all British. Then they had a huge influx of Americans. Lots of Americans worked on the tunnel, but the Germans moved all of them to a new American-only prison camp before they could actually use it. Sad. In the movie, there are several prominent Americans. I'm guessing that since it was an American production company, they wanted to appeal to their audience by having a few daring and dashing Yanks involved. And it's true; they did make some good characters. Hilts, the "King of the Cooler," was an awesome character. His face graces most of the DVD covers, yet he wasn't even in the real escape. One of my favorite quotes came from him when the Americans made their own moonshine to celebrate the Fourth of July. After filling a cup, he said, "American moonshine. Don't smoke after drinking it." He was known for being tossed in the cooler for months on end for his many failed escape attempts. He'd just take in a baseball glove and baseball and play catch with himself to pass the time. [Spoiler Warning] I was so sad when he was captured at the end! After running and riding and working so hard, you just want him to make it. But he doesn't. I have more things to add, but I don't want to ruin things for you. [Massive Spoiler Warning] A lot of the details that the movie added were right on. The air pump, dirt dumping, wood scavenging, fake papers, uniforms, etc. was all real. A lot of the events at the end were real too. It was true that the tunnel ended right before the woods and they had trouble getting away. Something that differs from the movie is the fact that it was winter at the time. That definitely makes escaping more difficult. Finally, there were only three who actually escaped, but they weren't the same guys in the movie. Instead of a Brit, a Pole and a Aussie, they were two Norwegians and one Dutch guy. Interesting. I do really enjoy movies based on history. It adds a whole new depth to the movie, and it's interesting to see what liberties directors take. What historical movies do you enjoy? as for other historical movies, i know have many i like, but i can't really think of them. Music Monday: Blindside's New Album!